Jim PathFinder Ewing, the author of seven books on eco-spirituality and mind-body medicine, will be teaching a three-day workshop on the river. Timed to coincide with the release of his new book, Redefining Manhood: A Guide for Men and Those Who Love Them (Findhorn Press, Spring 2015), the workshop will focus on reassessing the concept of men and their roles in today's society. Canoe builder and youth leader John Ruskey and his team of Mighty Quapaws will be your outfitters, guides and cooks for the expedition. Summary: 4-day weekend with paddling, camping and workshops. Muddy Waters Wilderness. This is a journey through some of the wildest & remote islands & forests of the Lower Mississippi. Described in a 12-page article in National Geographic Adventure Magazine, August 2007. Great back channels & oxbow lakes to explore. Fossil finding & rock hunting at Knowlton Crevasse & Catfish Point. Great swimming throughout. Abundant wildlife, exceptional birding, world class fisheries, the greatest concentration of white tailed deer in the country, as well as the Louisiana black bear. No towns or industry. The only evidence of civilization is the tugboats on the river. See http://www.island63.com/expeditions-muddy_waters.cfm for photos and description. Charge: $550 each all inclusive includes all workshops and teachings, shuttle, meals, guiding and outfitting, and everything you will need for the river. Special deal for fathers and sons, and same deal for couples: 500 each. Meet at 9am. Park your car, pack your bag and load the canoe. Shuttle to Mississippi River and set off downstream. 4 days on the biggest river in North America. Primitive Camping. Bring tent and sleeping bag, or arrange rental. Return to the same sometime mid-day. Unpack your bags. Say goodbye to new friends. Your car will be waiting you. Return home. The workshop is normally taught in two segments: one as a men's retreat (the "Men" part of the title) as a path for men in self-discovery and inner growth; and one for women ("Those Who Love Them"), so they can understand and help men grow in wisdom and stature to meet today's changing roles. This workshop is for men, women and children, or singles, and will focus on concepts in the book as well as living in harmony with nature, in keeping with being on the river. The outline of the three-day workshops is an evening session of approximately two hours, followed by a full day, then a morning session to wrap up and share what is learned. This workshop teaches men how to be men in a new, yet time-tested way, by reevaluating how they were brought up and determining which behaviors are suitable for adopting, and which are suitable for rejecting. No one is taught what to believe, only how to examine what is believed, so self-discovery can take place. Participants should bring notebook or paper and pens to write down insights and understandings. It is recommended that those attending the workshop read Redefining Manhood before the trip and be prepared to discuss the concepts. Some exercises in the book will be part of the workshop. Food & Gear: Quapaw provides all necessary river gear & emergency equipment. Normally we prepare all food & refreshments, drinks include spring water, juices and milk. Alcoholic beverages BYOB. We will pack all necessary cookware and eating utensils, as well as camp tables and camp chairs. Bring all personal gear and stuff into our waterproof drybags before launching (or use your own). These are backpack-style bags made of tough waterproof material - great for packing on a rainy day! It takes three complete fold to make them water-proof, be sure to lock all four buckles! If you have any questions, check with your guide. Be prepared for rain or intense sun UV exposure! Sunlight is surprisingly intense on the river, even in the winter (you get the sun twice - once from above and once reflected from below). Sunburn is our number one complaint and has caused more than one Mississippi River paddler very painful days and sleepless nights. Be forewarned! Sunglasses, sun screen, long sleeve clothing and a wide brim hat are all good ideas, especially for anyone particularly sensitive. We can supply tents & sleeping bags to anyone who needs them, $35ea/person/trip regardless of length. Otherwise, bring your own and pack with your gear into our dry bags. Camping: Remote islands, sandbars, towheads, usually sandy places, sometimes it's necessary to make a muddy landing. In inclement weather it might be necessary to find shelter within the forest. This is primitive camping on a river island, no services of any sort. Bring everything you need to make yourself comfortable. Bring your own toiletry. Bring a change of warm clothing, including summer months, when mornings can be cool. It's always cooler on the river. Charge: $550 each all inclusive includes all workshops and teachings, shuttle, meals, guiding and outfitting, and everything you will need for the river. Bring your personal items and camping gear and we'll provide everything else. Fee includes canoes, paddles, lifejackets and all necessary river gear, first aid kits and emergency gear; and meals, which include all the food prep, campfire cooking, cookware and eatware, and cleanup. Also includes shuttle and transportation of canoes and gear plus our vehicles and drivers to and from Clarksdale to the river. Deposit: $250 deposit required to hold date, remainder due at trip start. Deposit refundable in case of severe weather or other unforeseeable disastrous or dangerous occurrence. While women have forged ahead in the workplace and society, men are finding themselves increasingly marginalized, socially, professionally, economically — enough so that one book on bestseller lists recently has been titled The End of Men. This has led to calls for a men's movement and courses are being taught, but they are failing to find traction among men. The reason should be plain: where once Iron John stood as an archetype, along with the King, Warrior, Lover and Magician, those roles have become sadly outdated. The old archetypes of manhood no longer apply. In this book, the author of six previous books on energy medicine, Native American spirituality and mindfulness, outlines why the current courses on men's empowerment are failing and offers a new way of looking at male roles that predates the modern era. It is a "back to the future" approach to manhood that actually is better suited for the male psyche, having existed for thousands of years in all parts of the globe. Modernized, this "survival kit" for the male gender can revitalize male and female relations on a more balanced and time-honored footing. This book serves as a self-help manual for men, a guide for men's retreats, and a primer for wives, daughters, mothers and female friends to help the men in their lives adopt a newer, healthier way of living in balance with a society that is rapidly shifting its roles. Other books on this topic repeat tired stereotypes of the "king," "lover," "warrior," "magician" and similar shorthand versions of men's roles; but those roles no longer hold much value in today's society. In a society where women have more education and higher earning capacity than men, a woman can be "king." Women no longer sit idly waiting to be awakened by a Prince Charming; they are active lovers, emancipated from the Sleeping Beauty archetype. If men try to adopt outdated "lover" roles, they find themselves alone, even pitied. Women are warriors, and magicians, and welders, firefighters and CEOs. An "Iron John" who wishes to retreat into what he is taught is his strength in masculinity — the wild man of ancient times — will find himself alienated and out of step with reality. Conversely, if men try to adopt feminized versions of men's roles, they will find themselves equally marginalized. Women don't need men to be women. Nor do they need men who patronize them. The male spirit, in its purest form, is as wide and wild as the great distances that create our continent, and the vast landscapes that predominate: from the Appalachians to the Rockies, from the Great Plains to the Lower Mississippi Floodplain, from the Cumberland Plateau to the Colorado Plateau. All men are all born with it. But too easily it slips away only into the wild warlike side of things. Untempered by other essential manly qualities like wisdom and compassion, and without elders, or other living guides to point the way, Man's good qualities become wildly destructive. Jim Ewing's Redefining Manhood rekindles fires long neglected by Men and Those Who Love Them and let to burn out in our society. Jim is a fire-maker if nothing else. He has found ashes from fires that burned brightly in pre-christian societies where men and women worked in harmony with each other and with the mother earth we all live on, and depend upon for our survival. The native peoples embodied this spirit when they lived close to the land, and it was passed on through the generations through stories, trials, vision quests, agrarian practices, hunts and celebrations. Us Anglos, we sometimes find it, embody it, breathe it into our existence. But more often we lose it and let paranoia rule. Fear of the dark. Fear of the woods. Fear of bears. Fear of snakes. Fear of ladybugs. Fear of ladies. Fear of our more gentle qualities. Fear of art and poetry. Fear of being quiet. Fear of silence. Human paranoia too easily overcomes the ethereal spirit of the wildlands. Without parents, grandparents or elders to show the way, there is no way but to close the door on the fearful places and turn on the television or the computer. Redefining Manhood is a connection to that pulsing spirit of the male-ness that is flowing everywhere but is hard to hear amongst the noise and commotion of our busy lives. Jim Ewing looks beyond the loss of the "Wild Man" to find man's essential qualities in a path of peace. This pathway offers timely and much-needed alternatives to the pathways of fear and war which seem to be rampaging across our planet. Instead of aggression and greedy accumulation of property, Redefining Manhood discovers manly qualities of love, empathy, resolve and responsibility that predate the hardening of the christian world several millennia ago, and shows us how we can rejuvenate those beautiful qualities back into our lives for the benefit of all: our families, our friends, our society, our world. I grew up on the edge of Arapaho National Forest in the Front Range of the Rockies. My father taught me to walk softly in those ponderosa piney woods, a lesson which saved my life and gave me a life-long love of the multi-ever-varying forms and patterns of life. I have always been a misfit in society. But when I finally found myself freed by my father's gentle forgiving spirit, and the endless wilderness behind our house, I no longer cared. And the strangest thing was suddenly I fit in. What if you didn't have a wild woods to run around in as a kid? What if you didn't have mentors, or readings ' like Redefining Manhood to open your imagination to what's out there and to find your place in it? I shudder at the thought it is so confining and claustrophobic. Life without it would be like losing your way in a suburban neighborhood never to be able to leave, never able to escape the gridlock checkerboard tendencies of civilizations. Later in my life, in the flatlands and the structured East Coast prep school society it was some of the same lessons found in Redefining Manhood that once again saved my life, this time in my imagination, in my education, and in the mentors who watched over my growth through puberty into manhood. If Redefining Manhood had been published when I was going through those awful pimply pubescent years when I made so many stupid mistakes it probably would have saved me and my family several years of moral anguish, and fear of society. It probably would have saved my motherÊ¼s hair from turning prematurely grey, like mine is doing now. We are nature, not separate from it. It is only in separation that we invite worldwide environmental problems. When you experience the wilderness you begin to feel and care for it, and care for all its abundance of creative life forms, and colors and patterns, aromas and poetry and music. And then you become livened and emboldened with the passions it stirs in you. Jim Ewing's Redefining Manhood inspires self-reflection about manhood and the "downward spiral passed on through the generations" and gives us practices to discover them and change them. As Jim says, "Let the Dark Mother be dark no more... Let men become men, not perpetual adolescents... Let the "Father Wound" heal with inner nourishment shared by the whole family..."
Early on in the book, Jim asks, "Is there any hope to raise male children to become responsible, reasonable, rational adults?" Through the path of Peace, yes there is hope. Redefining Manhood will change your way of thinking about manhood, from inside to out -- from the spirit to the emotions to the head to the body -- and provide the steps for all of us to bring balance back into the long disheveled community of men and women, and the children we raise. I will be using Redefining Manhood: a Guide to Men and Those Who Love Them to help guide my apprenticeships with young men (and women) of the Mississippi Delta. I will use it in my own life to help in my maturation as an adult. Even though I am now over 50 I now see I have so much to learn and grow! Every man raising a boy should read Redefining Manhood. 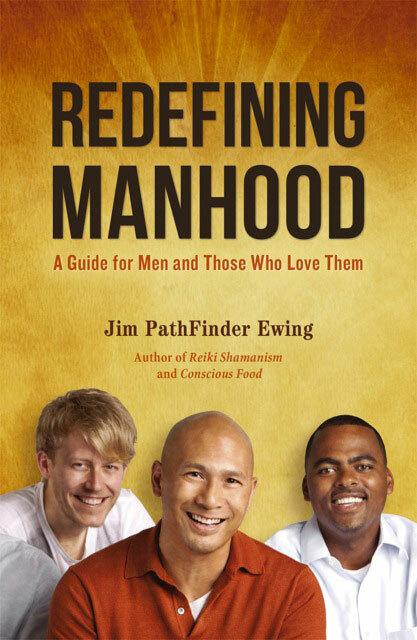 Every woman seeking a creating a balanced relationship should read Redefining Manhood. Every family should add it to the list of essential books, and follow the path of peace, to discover and live the best qualities of manhood, those that will bring long term health and joy to the family, and harmony to the beautiful earth we live on.